Read Meg Cabot's "heartbreakingly funny" new story (Kirkus Reviews). Better World Books > This bookseller will donate its profits! What You Wish For is a collection of short stories and poems for ages 12+, organized by Book Wish Foundation, an all-volunteer 501(c)(3) public charity. We will donate 100% of our proceeds to the UN Refugee Agency, UNHCR, to build libraries in Darfuri refugee camps in Chad. In stores September 15, 2011, published by Penguin/G.P. Putnam's Sons. Meg Cabot fans: have you read her new story? 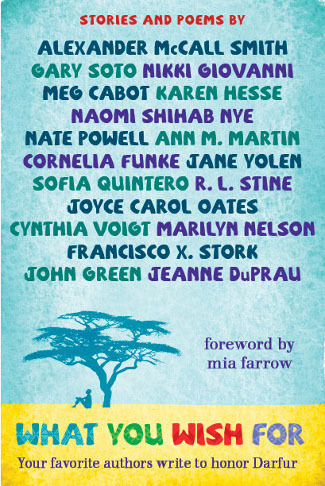 Meg Cabot, the author of The Princess Diaries, Avalon High, Airhead, Abandon, The Mediator, Allie Finkle's Rules for Girls, and many other beloved titles has contributed a new story to What You Wish For, a special charitable anthology about wishes. Kirkus Reviews wrote, "Meg Cabot's nerdy hero, seeking a friend, is heartbreakingly funny." If you're a fan of nerdy heroes or funny, you won't want to miss this. Plus, when you buy What You Wish For, we'll donate 100% of our proceeds to the UN Refugee Agency, UNHCR, to fund libraries in the refugee camps in eastern Chad that are home to more than 250,000 refugees from Darfur (most of them children). We're Book Wish Foundation, a 501(c)(3) charity providing high-impact reading aid for people in crisis. Why not join forces with Meg Cabot and the other amazing authors behind What You Wish For, so that some of the most vulnerable people in the world can benefit from books, like you have?